Taylor, Charlie, and Jamie have traveled all the way to the United States from Australia to attend the ultimate fandom convention, SupaCon. Charlie has a fan base of her own as a vlogger and actress promoting her first movie and was able to use her new celebrity status to get lifelong friends Taylor and Jamie into SupaCon as well. Charlie's co-star, the swoon-worthy Reese Ryan, is also her ex-boyfriend and his presence at SupaCon complicates things for the young actress. She strikes up a relationship with fellow vlogger and super cool-girl Alyssa Huntington and discovers that her crush on the internet star isn't in vain. While Charlie and Alyssa are exploring their new relationship, anxiety-prone Taylor and trusty sidekick Jamie are determined to make SupaCon the best experience ever by meeting their favorite author. Taylor must overcome her deepest fears in order to get what she wants. Jamie helps her to realize that what she really wants is him in this geeky romance. Queens of Geek is full of book and movie references and is a fun look at the fandom convention phenomena. Taylor's anxiety and experience with Asperger's is treated sensitively. The story is told in chapters alternating between Charlie's and Taylor's point of view, giving the reader a chance to see inside both of their minds. 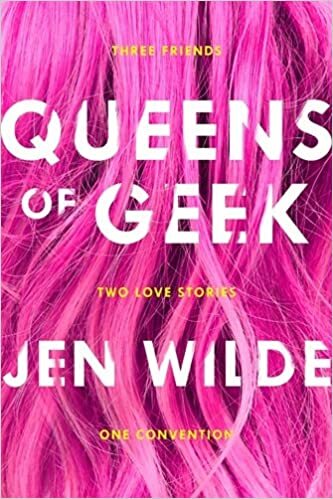 Queens of Geek is a fun quick read that will appeal to romance readers and self-proclaimed geeks.